Material Obsession: The Quilt Show!! If you follow along with me at @matobsgirl or @materialobsession you might have noticed a few things keeping me busy this year!! The most common question people ask me is, "How do you do it all?" Answer...not sure but there isn't anything I don't want to do (except clean the house!) so I just do it all and enjoy as much as possible! In truth, one tip is that I use my alert thinking time to plan for the times when I am brain dead and can only do the making part. It helps to have projects in different states of progress to fit every mood or making time. Travel projects, tv time projects...design wall or sewing all have different aspects that make them doable if prepped properly. I have been teaching in the USA a lot this year which has been fantastic fun. 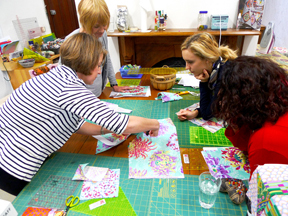 I love bringing the spirit of Australian quilters into the workshops where ever I go. What is that? Well, its a sense of being resourceful and creative without loosing touch with the traditions that make quilting so exciting today. We have all the gadgets, fabric collections and social media outlets to keep us engaged but the most important thing is our imagination! To that end I have been working on the premise of Organic Applique....which is...use simple techniques to bring unique ideas to life! I have always admired applique artists but never dreamed I would one day have the skills to call myself one. When I first tried it there were lots of comments about my clunky fingers and weird stitches from teachers and friends. So...I gave it up but after years I have returned after learning a few tricks that make it easy and good results achievable. One of the fun things that I did earlier this year was to visit Denver to film two episodes for The Quilt Show with Ricky Tims and Alex Anderson. It was an experience like no other. Firstly, the production people are top notch. It went without a hitch from first introductions to final wrap and that always makes things fun. It was great working with two experience quilting professionals. It was a bit daunting for someone so far down under to plan for such an opportunity. I was wondering what to do when my son Noah said in no uncertain terms, "MOM! My quilt is too small and I need you to make me a bigger one!" I had a long list of things to do and at first his comment (read demand) sent me into a tail spin of anxiety...WHATt should I make that is quick and fun and appropriate for a young man's home? WHEN can I find the time to make him something? HOW could I not do it? Then BINGO! I realised I could combine two projects into one if I made a cool block for The Quilt Show and for Noah's quilt as well! That was the start of Magpie Dreaming. This is a quilt that I made using the Dreamy colourway of my collection Horizons for FreeSpirit. I used a wedge ruler to make the portal blocks and you can see how on the Modern Wedge episode of The Quilt Show. This is Magpie Dreaming in Dreamy colourway. One of the things I like about designing quilts is using a variety of styles, colours and values in fabrics. Most of the time when I am teaching this is the thing people want to know from me...how do I combine the fabrics. Working on a project like this was the perfect opportunity to go through my stash and find all the fabrics that I think work to bring out the best of my collection. When I was finished with Noah's quilt I liked it so much I made it twice this time in the Moody colourway. I enjoyed seeing how the pattern worked well in both a subtle manly colorway as well as a vibrant more feminine palette. Using Tula Pink Stripes and Anna Maria Sweet Dreams in the portal ring was really effective. I also like how the Blowin Away print works as decorative sashing against the Chain Link Plaid. I like a lot of visual activity in my quilts! These quilts will be on display this month at The Hunters Hill Quilt Show at the Hunters Hill Town Hall 10-12 August. 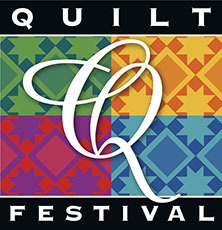 Its a great show if you are local...come to see the quilts and enjoy the special sandwiches and scones as well! Nothing like a local show!! In addition to the Magpie Dreaming block I did a demonstration of the theme for my new book due out early 2019! 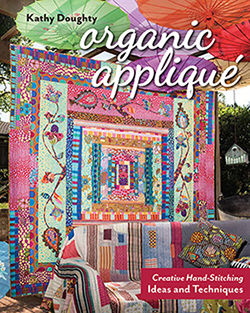 Its called, you guessed it...Organic Applique! I have learned some great tips for making applique easy and unique as well...part of it is not worrying so much about being exact but actually having a play with shapes and placement to make every project a bit of my own...or yours if you choose to make it! To bring that idea to life (and not spoil the projects coming up in the book!) I designed a pot of flowers for The Quilt Show. It started with the idea that plaids make great backgrounds...we had just gotten our hands on some fun plaids in a job lot and so I got busy! This was super fun to make! I'd love to hear what you think about the show and if you have any questions just shoot me an email! Thanks for visiting the blog! I have been eagerly awaiting your show on TQS. Love your use of such bold prints and colors! Great show, now eager to see the next one. I just watched your show, and I love the wedge quilt! I am more of an applique person, but I think piecing with your wedge and then stitching it down combines the best of both worlds. I've loved your color sense for quite a while, and I may just go off a cliff myself. Really enjoyed the energy and colour in your work both in the show and your books. Will have to visit when in your neck of the woods! keep up the inspirational work. Your show was such fun. I visited your shop a few years ago and loved the energy and the welcome I got as a visiting Canadian. At that time I saw the colours and combinations and it has inspired me ever since and put me on a journey of colour and working outside the box. Thank you. I love your color combos and all of your work that I've seen in books. 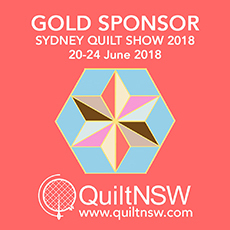 The Quilt Show was nearly overwhelming me with creative ideas.Most of my quilting friends do regular blocks and have perfectly lovely quilts.I have always been a bit different with color usage and and think your work has allowed me a different direction! From the very first time I looked through your book "Material Obsession", I have been drawn to your work and choice of colors. Thanks for keeping the inspiration going. Everything is marvelous! I saw you at Empty Spools this year wearing a crown for your birthday!! !